The first full launch week for the latest Call of Duty title has already passed us by and with that comes some rather sad numbers that make it hard for me to even stay interested in watching. For the reasons I mentioned before I still haven’t purchased IW/MWR and I still don’t plan to – at this point I may not even waste the bandwidth giving the Steam Free To Play Weekend a try (which will probably be early to mid December). 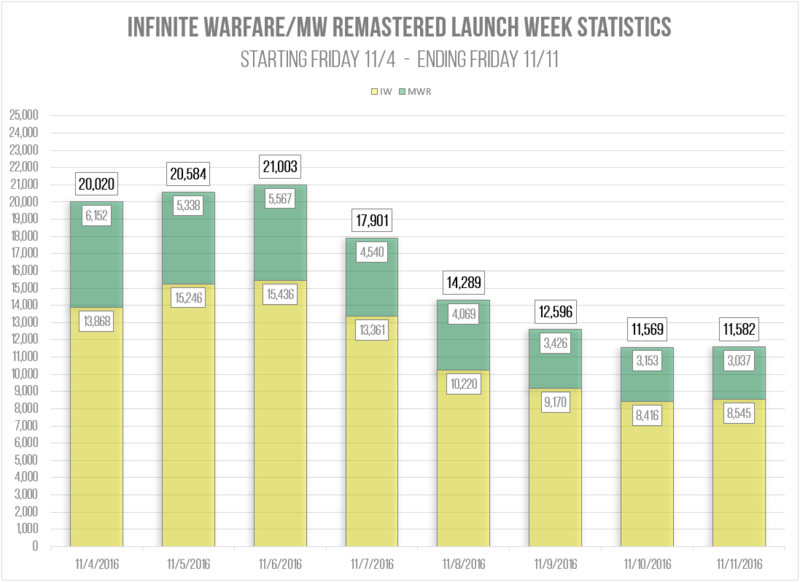 Below is a look at the launch week numbers. I will have some other comparisons with previous years posted in the Content section at some point this week – but there really isn’t much of a comparison. There seems to be very mixed reactions for both games but I won’t get into all that because there is plenty to read on that topic elsewhere. I like to talk about numbers and the launch numbers shown here definitely set a record for the worst launch numbers on PC since at least Modern Warfare 2 – but I would probably go back to even World At War or maybe even the original COD4 but I don’t have numbers on those two titles so I would only be guessing. If I had to make another guess I would say that the Infinite Warfare player counts will be down to Black Ops 3 level in a matter of a week or two. Imagine a game that is less than a month old and you won’t be able to play 90 percent of the game modes included unless their is a special event going on in game. I feel incredibly bad for the individuals who bought into the Season Pass. It’s been bad the last few releases with trying to play DLC just a few weeks after release but I have to assume it will be a matter of days with Infinite Warfare after release. The cost just can’t be justified anymore for how quickly parts of the game become unplayable with poor player counts. It will be interesting to see how Activision, Infinity Ward and Raven Software handle the time left with these titles and really what it means for the future releases. Will this drive a major change in the series? Is Sledgehammer games scrapping every single thing pertaining to “Call of Duty:Advanced Warfare II” and going to boots on the ground as fast as possible? 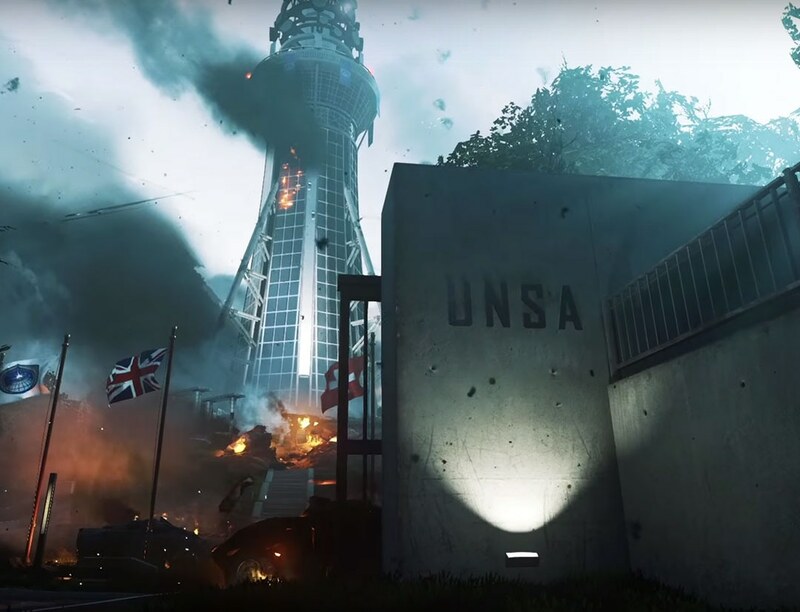 I don’t know; but I do know that after a number of rough years for Call of Duty on the PC – this is another devastating blow that may stop any chance of it making a comeback to what it used to be. I’ll update this post later on with complete numbers when we actually wrap up the full launch week on Friday but generally the peak numbers are always in decline after the initial launch weekend “surge”. Aside from just the PC side of things I’m talking about here; this morning other outlets like PC Gamer, PCgamesN and GamesIndustry are discussing player counts and the overall sales data – all of which doesn’t appear to be very good news at this point. Day 1 (Friday) tallied up to be rather low for a Call of Duty launch – actually the lowest peak players on the first launch day since the Modern Warfare 2 release on Steam in 2009. Modern Warfare 2 being the first game as a Steam Exclusive which allows this player tracking – prior to that the only number to go off would be reported sales figures and they are sketchy at best. To be fair however; the first launch day is never the strongest – in fact it has never been since the release of Modern Warfare 2 on Steam. Day two and three are the best ones to watch. Day 2 (Saturday) starts to get a little interesting because Saturday & Sunday are usually the strongest of the launch days; and Saturday was in fact stronger than Friday but oddly when looking at all of the previous Call of Duty titles they actually had more peak players than the previous 4 weeks when looking back at Saturdays – except for the case of Black Ops 3 where it’s still holding around 9,000 but did drop over 2,000 from the previous Saturday. This would make sense that the largest group is moving from the previous Call of Duty title to the newest Call of Duty title but I do find it interesting that more people were in every other older COD title than the last 4 weeks. That tells me Infinite Warfare & MW Remastered players are largely based upon existing Black Ops 3 players, plus other non-COD players with the usual “first timers” mixed in there as well. Day 3 (Sunday) with what would normally be the highest peak day for a launch and also the highest peak day for the normal week; Sundays peak only adds an additional 419 players over Saturday’s peak. All other COD titles seem to hold solid with previous weekend peaks except once again the Black Ops 3 peak drops a little more similar to yesterday by a little over 2,500 less than last Sunday’s peak. 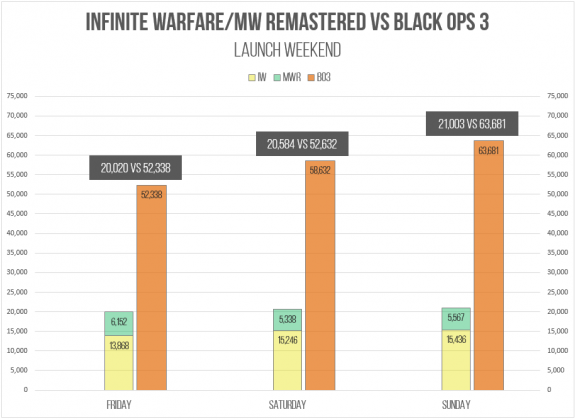 Overall for Sunday wrapping up a Call of Duty launch weekend; it would appear that Infinite Warfare & Modern Warfare Remastered are still under performing all previous Call of Duty titles at launch since Modern Warfare 2.